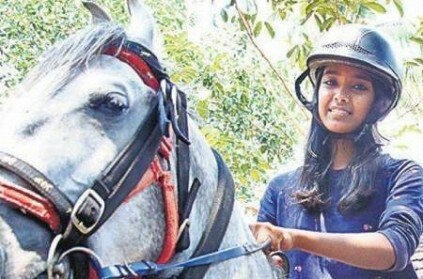 This teen from Kerala's Thrissur district, who took social media by storm after a video of her riding a horse in a school uniform went viral has revealed her special reasons of riding a horse that exciting day. The girl identified as Krishna, said that the viral video was recorded when she was going for her last Class 10 board examination. In the video, she can be seen confidently riding the horse in good speed on a narrow town road as she firmly held on to the horse's neck. Krishna took up horse riding as a hobby when she was in Class 7. After years of training, she felt so comfortable riding a horse, and she has earlier too rode the horse to school. On speaking to Asian News International (ANI), Krishna said "I do not go daily on horses. Only on some special days, or when I get bored or on some exam days also, I ride on a horse to school. If you ask me what was special on that day that was the last day of my 10th standard board exam. One of my friends said that riding a horse isn’t that easy and it’s not possible for a girl to do that. He said it’s only possible for women like ‘Jhansi Ki Rani’. So I thought why not a normal girl can ride a horse." கூண்டில் பிடிப்பட்டதால் வனத்துறை வாகனத்தைத் தாக்க முயன்ற கரடி! வைரல் வீடியோ! This page contains news relating to various facts and events. The views are generally about current affiars and general topics in diversified areas such as political, international, national, and regional issues, sports, health, travel, lifestyle, technology and business. People having similar interets on the above topics will find this page useful. Must Read! Kerala Teen's Reason as to Why She Rode Horse To Exam Hall | India News.